Start a Live Chat with a Customer Service rep to receive the price! Sat & Sun: 9AM-4PM EST. Installing your Nor-Lake Kold Locker is fast and easy with just three people and 15 minutes. Here, we show you just how easy it really is. Make sure to keep the included product manual handy for detailed instructions on each step. Take the time to follow the steps explicitly. Start by positioning the foamed walk-in floor panels in the desired location. Secure with the included hex wrench using the technique outlined in the product manual. Next, it's time to install the first corner panel. Notice that the panel is labeled "Top" along with a part number indicating that when the panel is in its proper position, the labeled end will be up. Notice, also, that the section latch access holes on the vertical edge of the panel are always on the interior of the panel. Position the corner panel in the proper location on the walk-in floor and flush the corner panel with the corner of the floor panel in both directions. Lock it securely to the floor panel. 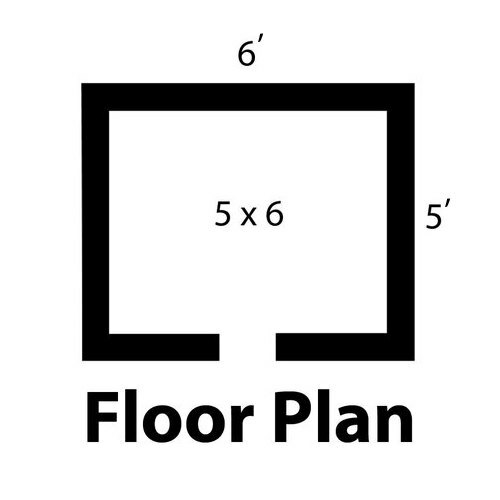 Select the next panel as indicated on the floor plan and position it on the floor close enough to the first panel installed so that section latch engagement is possible. Making sure that the two panels are perfectly aligned at the TOP EDGE and that the VERTICAL JOINT of the two panels are perfectly flush, turn the section latches on the vertical edge of the panel until they are completely engaged. Insist that the top edges of the adjoining panels are aligned perfectly and verify with a level. If misalignment is encountered, merely lift the lowest panel edge while locking to achieve alignment and, when all latches are engaged, permit the locked panels to resume their normal position on the walk-in floor. Continue erecting panels according to the part numbers shown on the floor plan, and follow, explicitly, the technique described for panel alignment. Once all of the walls are up, with the exception of the last remaining cornel panel and the front/door panel, it's time to start on the ceiling. Start by placing the condenser atop the proper ceiling panel as outlined in the floor plan. Secure properly before proceeding. Lift the ceiling panel/condenser up into position above the side panels. Next, bring the front/door panel into position and secure. The last remaining corner panel should be placed into position once the front/door panel is positioned, and finally, the last remaining ceiling panel should be positioned. Secure all unsecured panels at this time and seal properly. Then plug the unit into designated wall receptacle and you're done! Putting together your Nor-Lake Kold Locker can be done in about 15 and a half minutes. You will see how easy it is to install yourselves in this step-by-step demonstration video. How can I determine the size of this product's interior? The interior of a Nor-Lake cooler can be determined by subtracting 8" from each exterior measurement. Each side panel is 4" thick, and each exterior measurement contains two panels. For Nor-Lake freezers, the panels will be 4"-5" thick, so subtracting 8"-10" from each exterior measurement will give you a good idea of interior size. Where will the door be located on my walk-in cooler? The "Walk-In Floor Plans" document on this page has a diagram with all of the possible floor plan options for Nor-Lake walk-in units. This shows the standard and alternate door configurations for each size option. If you are interested in one of the alternate door configurations, first choose whether you want a left or right door hinge and then check the dropdowns at the top of the page - additional door configurations will be shown there, if any are available, and you can then select the right door configuration code for your application, using the codes in the diagram as a guide. If you don't see an "Optional - Alternate Floor Plans" dropdown, no alternate configurations are available for this particular unit. Be aware that on units with wall-mounted refrigeration, selecting an alternate door configuration will move the refrigeration unit to the wall opposite the door, for proper airflow. If you do not choose another floor plan, you will be shipped the standard configuration. 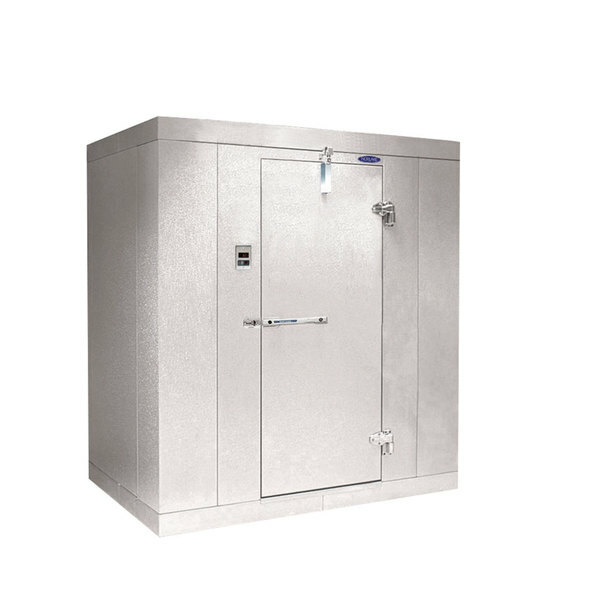 My city or state has special requirements for walk-in refrigeration - what do I need to know before purchasing this item? Chicago residents: Chicago residents are required to purchase a pressure relief valve with their walk-in cooler. Pressure relief valves are recommended for improved safety. These valves help refrigerant from exceeding dangerous pressures. Oregon residents: The state of Oregon charges a tagging fee for inbound shipments of this item. You will be contacted regarding this fee after placing your order. If you have any questions, please contact Special Orders prior to making your purchase. The Nor-Lake Kold Locker 5' x 6' x 6' 7" indoor step-in cooler box offers versatility and superior storage space all in one easy-to-assemble unit! Refrigeration sold separately. The panels on the Nor-Lake Kold Locker indoor step-in cooler box are made of coated 26 gauge corrosion-resistant embossed galvanized steel. The panels are insulated with 4" thick CFC-free HFC polyurethane to maintain consistent temperatures. An aluminum floor seals the structure and provides a durable surface for storage. A self-closing door secures easily to the Nor-Lake Kold Locker step-in cooler box with cam lift hinges and has a 26" opening. A NL9800 deadbolt locking handle with independent padlock and an inside safety release protects your supplies and your employees. An externally mounted digital thermometer allows you to easily verify that the step-in is maintaining the correct temperature, while a vapor proof light provides excellent interior visibility. This product can expose you to chemicals including 1;3-butadiene, which are known to the State of California to cause cancer, birth defects, or other reproductive harm. For more information, go to www.p65warnings.ca.gov. WARNING: This product can expose you to chemicals including 1;3-butadiene, which are known to the State of California to cause cancer, birth defects, or other reproductive harm. For more information, go to www.p65warnings.ca.gov. RESIDENTIAL USERS: The right is reserved to deny shipment for residential usage; if this occurs, you will be notified as soon as possible.